Begin your days at Villa Platinum Coast by sitting on the balcony, sipping a cuppa tea and staring out at the ocean, watching the boats bobbing on the water that goes on as far as the eye can see. Begin your days at Villa Platinum Coast by sitting on the balcony, sipping a cuppa tea and staring out at the ocean, watching the boats bobbing on the water that goes on as far as the eye can see. The palm trees sway in the sea breeze, as the lush green plants brush against the golden sands. It sounds like a dream, but with Villa Platinum Coast, it can be a reality. This six bedroom villa sits right on the Mullins Beach, the famous platinum coast in Barbados, which consists of the main house and a small cottage, both of which have a living space and a kitchen. It's a bright, airy, cheerful home away from home. The tropical theme is also continued inside, with luscious plants and beautiful artwork adorning the walls. There's no lack of colour, with sea-inspired blues adding pops of colour throughout the home. The open plan living area offers the perfect spot to relax and recuperate, whether that's reading a good book, watching a movie on the large television or simply sitting around as a group talking or playing games. The best thing about the open plan living is that everyone can be together while doing their own things. This area also opens out onto the balcony, with sea-views so if you need to seek some respite from the heat, you can do so with the blissful air conditioning that runs throughout the home. There's also a little living room nook in the cottage, perfect for kids or other's who want a little more solitude to read, write or game. The kitchen area in the main house is large and has everything you could need to cook up a feast, to then enjoy on the balcony overlooking the ocean, of course. The kitchen in the cottage is also well-equipped for preparing meals, which can be enjoyed outside or on the small breakfast table. This villa has six bedrooms, a Master and three twins in the main house, and two other bedrooms in the cottage. All of the bedrooms are spacious and offer plenty of storage, so your Barbados wardrobe can be hung up and ready to go. Each room is also bright and colourful, inspired by the cheer Barbados is known for. There are four bathrooms, two ensuites and two shared bathrooms, one of which is in the cottage. This pink house is the perfect getaway for a break in Barbados. Villa Platinum Coast is a 6-bedroom villa, that has a detached cottage. Built upon Mullins Beach, you and your guests have spectacular views of the Caribbean Sea. Guests also have access to Sugar Hill Club's facilities that include a communal swimming pool and gym. Famed beaches that stretch on for miles with crystal clear waters that are calling your name – Barbados is a must-visit destination. This island is located in the Caribbean, and it's arguably one of the most popular travel destinations due to its stunning natural wonders and its beautiful beaches. There is, of course, more than just beaches and you have to make sure you explore some of the history-rich offerings and, without a doubt, try some of the incredible food – leaving without trying Cou-cou and flying fish would be a huge shame. This villa is located on the west coast of Barbados, on Mullins Beach, which happens to be one of the most popular beaches on this coast. It's no surprise, there are crystal clear oceans as far as the eyes can see and the golden sand beach is lined with palm trees. You can sit at the beach bar, enjoying a cocktail and taking in the sea-breeze or you can partake in any of the adrenaline water sports activities offered at the beach. 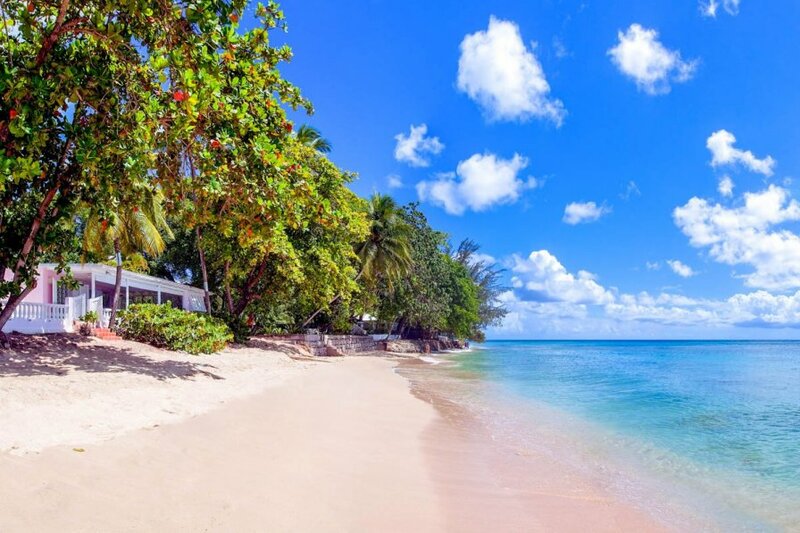 Mullins Beach is also close to Speightstown, the second largest town in Barbados which offers plenty to see, do and eat. The area, also known as Little Bristol, is 12 miles from the capital city of Bridgetown – so you really have the best of both worlds at this location with miles of some of the best beaches Barbados offers to the luxuries of two of the biggest towns.